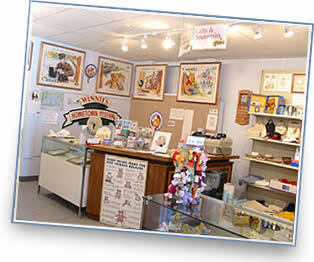 Stop by the White River Heritage Museum and discover the rich history of White River, Ontario! The Museum has hundreds of items on display for all ages. A.J. Casson Artwork: a copy of the oil on wood sketch painted by A.J. Casson, the youngest member of the famous Canadian artists known as the Group of Seven. We have an extensive collection of Winnie the Pooh items. The largest collection we have received is the "Lisa Yee Collection" from Orlando, Florida. In addition, we have a gift shop featuring many Winnie the Pooh items for sale, including mugs, plush Winnie characters, Royal Doulton figurines, the "Where it all Began" line, and a great deal more.